The subject for the 5th edition of Smile for the Camera: A Carnival of Images is "Hair Do's and Dont's." This photo was part of my great-grandfather's papers. That's all I know. He was from Germany, so I'm guessing this is a relative back in the home country. My great-grandfather came to the United States in 1914. I call this guy "Hat Dude." If anyone can shed some light on this uniform or its era, I'd really appreciate it. He seems very proud of his threads. I'd like to know more so I can share in that admiration. "Hat Dude" is to die for! What great grandfather is this Lenertz, Williamson or Thibodeaux? I think this guy worked at an amusement park or maybe that is his halloween outfit. Nice photo, Amy, but I believe your hat dude might be a hat lady instead. I agree, it's rather a manly pose, but the body shape suggests to me a female figure. Also, do I detect some whisps of long hair escaping from the extraordinary hat, at the back/nape of her/his neck? 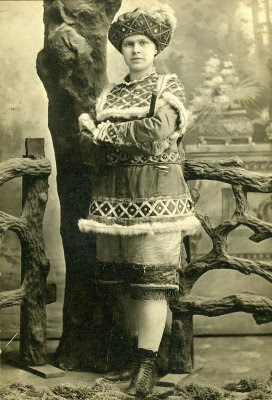 I think this must be a costume - and not a very well kept one, at that (note the damage around the waist) - so perhaps it is a young woman pretending to be a man. Is that some sort of musical instrument that he/she is holding in his right hand? The studio setting, with it's papier-mache fake tree and "rustic" fence, elaborately painted backdrop, and very poor imitation grass (made of string?) strewn on the studio floor, looks to me fairly typical for the early 1900s, which is when I believe this must have been taken. An interesting picture, thank you.